Hope you have read my article on North Indian postnatal care. 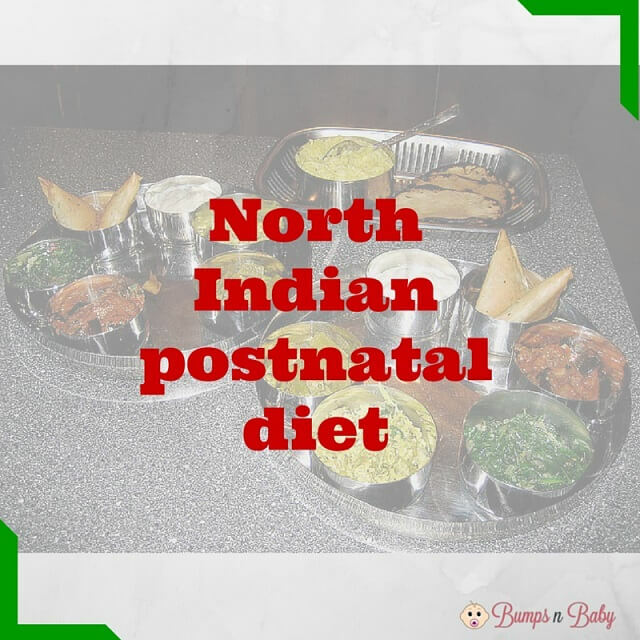 As promised in that article, here I bring to you details about the postnatal diet followed as part of the north Indian postpartum care. Why postpartum diet is considered very important? During the confinement period food that the mother eats is considered equivalent to medicine that helps the mother to regain her physical and mental strength. Diet followed as per north Indian tradition is rich in ingredients that keep body warm, help in lactation and also helps in digestion. Below is a list of North Indian postnatal foods that I had after my delivery. The main reason new mom should drink water after delivery is because water is an important constituent of breast milk. So drink up plenty of water to increase milk flow and decrease dehydration due to breastfeeding. Drinking water also helps to reduce your chances of getting infected with a urinary tract infection. Intake of plenty of water also helps to keep your energy levels high. Ghee is added in almost every item prepared for post delivery – from laddus to rotis to homemade snacks. Ghee nourishes the body when taken in right quantities. Ghee actually increases digestive power and helps in smooth bowel movements. Pure ghee is high in nutritional content and helps in the recovery of the mother’s body from the stress of pregnancy and childbirth. A pinch of turmeric is added in milk and is taken in early morning. Turmeric contains vitamins B6 and C, fiber and potassium and helps to heal internal wounds. Turmeric milk helps in the healing process. So let us go through each one and its benefits. Gond is a kind of edible resin and is available in all supermarkets. These laddoos contains dry fruits and nuts in it and is very good for nursing mothers. They are very good during winters and can be kept for many days in airtight containers. Gond and ghee help in lubricating the joints and reduce back pain or joint aches. These ladoos can be had as an after meals snack. Methi (fenugreek seeds) is really good to increase the milk supply. Methi laddoos are also known to help with backaches. For better results these laddoos are taken in the morning with milk. In Maharashtra these laddoos are must during confinement. These laddus are made from seeds that are called Aliv or haleev in Marathi. They are rich in vitamin A, C and folic acid that are necessary for post partum women. They are also rich in calcium and iron. These small, flat seeds are high in calcium, iron, copper, and magnesium. They are also popularly considered helpful in regulating bowel movements. These ladoos are made with dates, ground almonds, and grated coconut. It is served as an item in breakfast or as an in between meal snack. They are high in Vitamin and nutrition. These laddoos are common in north India postpartum care diet. This ladoos are a must for nursing mothers. Bajra (millet) is a common grain consumed widely in India. It is a good source of energy and is rich in fiber that helps in digestion. Bajra ki roti is flat bread or roti made using millet. This is a breakfast recipe made from semolina, ghee, ground almonds and milk. Rava ladoo is also considered good for health post delivery. It is high in vitamin C, essential fats and fiber. This makes a good breakfast or dinner option for new mothers. These are bread made from whole-wheat flour mixed with ajwain (carom). It is believed to help clean the uterus and aid digestion. Ajwain also improves lactation. It comprises of broken whole-wheat grain. Porridge made with broken wheat serves as a wholesome breakfast option or evening snack. It is very high in fibre and calcium and helps to reduce constipation that every mom faces post delivery. Khichdi consist of dal and rice. Moong dal is rich in protein and carbohydrate . Certain foods are believed to increase the supply of breast milk. It helps to soothe pain due to gas or indigestion. Every morning boil four glasses of water with two tablespoon of carom seeds (ajwain) and drink this water. The water allows cooling down the body temperature to room temperature. Fennel helps to increase the milk supply. They are rich in vitamin c and helps in digestion. Saunf ka pani is regularly given to the nursing mothers. Fenugreek seeds are the traditional food that helps in lactation.These seeds are boiled in water and are taken in the morning after food. These seeds are rich in iron and calcium. Fenugreek seeds are great to help prevent and ease back and joint pain. Jeera water is taken for the initial 6 months after delivery. It helps to fight against infection and stomach problems like gas. Jeera seeds are also said to cure the problem of low breast milk supply. To prepare this kheer aliv seeds are cooked in milk. This sweet dish can be had as an after meals snack. It is high in vitamins and minerals and also helps in increasing breast milk. This helps to increase milk supply and aids digestion. This is a traditional receipe.It provides vital nutrition and helps in lactationThe recipe for harira includes dry fruits like almond, pista, walnuts and cashew. It also contains watermelon and pumpkin seeds. Garlic is a excellent source that helps in lactation. They are rich in calcium and helps in milk supply. It is an tradional north inidan energising food. These are prepared with mix of dry fruits, which helps in lactating. They are often taken with milk. Panjiri generates heat inside body that helps in getting rid of impure blood after delivery and thus helps in clearing uterus naturally. Leftover food is avoided and organic fresh food is preferred. The new mother should eat on time and in adequate quantities so that the digestive system is not affected. These were the food items I had during my confinement period as per the postnatal diet followed in North India. Which diet did you follow as a part of postpartum care? Please feel free to share with me in comments. A Keralite by birth, bought up in Mumbai and now staying at Doha, Geetu is a mother to a 2 year old naughty pie. She believes motherhood is the best thing happened to her. Your diet plan is so perfect. Just a small question if u can help me. My baby is Vomitting like anything. Plus sometimes he cries at night. Doctor said baby is fine. No need to worry as weight is normally increasing. My mother in law said that I should not eat ghee , dry fruits or any such food which are heavy like ghee and nuts. She says ki baby kamjor hai or incheezon ko jhel nahi paara isliye usko pet dard hits hai. Is that true dear coz I don’t think she is right. Plus I guess I have to eat nuts and ghee as my bones pain a lot. Plz help me dear…Should I avoid taking ghee, nuts or ladoos made from ghee and nuts? No she s wrong…if ur baby is fine wid weight and as per doctor so u can continue having ghee, nuts etc. Remember it does not add heaviness to your baby thru milk. So eat as its considered remedy for faster healing.